Piranha's Pursuit is a 1-vs-3 minigame found in Mario Party. It reappears in Mario Party: The Top 100, with Petey Piranha replacing the Piranha Plant. The game starts out with the Piranha Plant in the ground at small size getting showered by the rain and coming out of the ground. When the camera zooms out and shows everyone, the mini-game starts. In Mario Party: The Top 100, instead of sprouting out of the ground, the tiny Petey flies in from offscreen, and attempts to roar, although it sounds more like a sigh due to his small size. 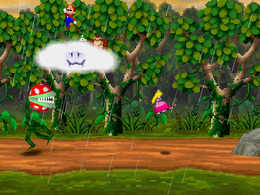 The players on the cloud have to Ground Pound the cloud to feed the Piranha Plant with rain while the other player has to run away from the Piranha Plant and avoid obstacles along the way. If the Piranha Plant catches the other player, the three players win. If the other player manages to run away from the Piranha Plant long enough, the other player wins. If the team wins, the Piranha Plant will catch the solo player, shake them violently and laugh at them while the announcer says "Miss", and the solo player will do a losing pose. 15 of the solo player's coins go to the winning team (each of them gaining 5 coins). In Mini-Game Island however, the coins won't show if the player fails and the announcer says "Finish" regardless. If played in Mario Party: The Top 100, Petey Piranha will simply just knock the solo player off the screen. As there is no "Miss!" voice clip in Mario Party: The Top 100, the announcer says "Finish!" instead, and each player of the team earns coins while the solo player loses nothing. If the solo player wins, the Piranha Plant will crash and fall backwards. Each player of the team of three forfeit 5 coins to the solo player (with the solo player gaining 15) and the solo player will do their victory pose. The coins within the minigame don't appear in Mario Party: The Top 100, but the solo player will still win coins while all other players lose nothing. Game Rules – "Press repeatedly to escape the Piranha Plant. 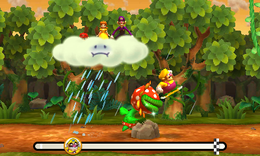 Players on the cloud Hip Drop to feed the Piranha Plant with rain." Advice – "As it rains on the Piranha Plant, it gets bigger and can jump farther." Description – "The chase is on as 3 players give Petey Piranha the water he needs to stalk the fourth!" On-screen (Solo) – "Run from Petey Piranha!" On-screen (Team) – "Ground Pound to make it rain on Petey Piranha so he grows!" This page was last edited on January 30, 2019, at 09:57.